We offer tipi rental around the following areas. Here you will find a guide on things to do a places to see, with the closest to Ogmore being first. The whole area around Ogmore is of outstanding beauty with plenty to do and see. There are so many beautiful sights here for you to enjoy. Ogmore Castle was initially constructed soon after 1100 by William de Londres as part of the Norman invasion of Wales. The castle was in use until the 19th Century for a range of purposes, including a court of justice and a prison, but is now a substantial set of remains and local landmark. Click here for the story of Ogmore Castle. Watch TV weatherman walk being guided through the beautiful sand hills of Merthyr Mawr. The sand dunes at Merthyr Mawr are the largest slack of dunes in Europe and overlook the Bristol channel, Porthcawl, Ogmore by Sea plus Ogmore and Candleston Castle. The Glamorgan Heritage Coast is sandwiched between Swansea and Cardiff, and it has a lot to offer - woodland walks, castles, picturesque villages, fossils and fantastic beaches. 52 stepping-stones lead across the ford of the Ewenny and Ogmore rivers to the pretty village of Merthyr Mawr. Local legend has it that they were laid for a love-sick girl who lived in the castle. Her lover lived across the river, and their meetings were impeded by tides and floods. Apparently the stones served their purpose - the lovers married in 1233. Riding a horse on a wide open beach near the lapping fringe of the sea is a dream for many people. At Ogmore Farm near Bridgend in South Wales this dream is a reality, every day. From the Ogmore Farm, go across the stepping stones on the river Ewenny and then over the Swinging Bridge into the beautiful village of Merthyr Mawr with its thatched cottages. As you walk through Merthyr Mawr towards the dunes you will see amazing wildlife, a beautiful church and depending on the season strawberry fields that you can pay to pick. There are two castles, Ogmore Castle which is in Ogmore and Candleston Castle. A pleasant walk away to the west of the Ogmore Farm, Candleston Castle can be found at the entrance to the Merthyr Mawr Warren, the highest sand dune slacks in Europe. 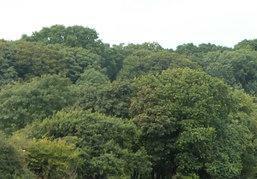 To get to this castle from the tipis walk to Ogmore Farm then through Merthyr Mawr village as described above. Ogmore by Sea is a beautiful part of the heritage coast and is far from commercialised although it does have a Cafe Bar "Franklins Cafe Bar" http:www.franklinscafebar.co.uk, a Post Office and a general store. Ogmore by Sea boasts several beaches which are good for surfing, fishing and the bathing. Ogmore by Sea - Main Beach "The Front" or "The River-mouth"
Follow the river east from Ogmore for about a mile and a half, a really nice walk along the rivers flood planes or above on a high tide. Ogmore beach is a large sandy beach ideal for sunbathing, swimming and surfing, make sure you take notice of the lifeguards flags as there are some nasty currents in certain places. In the peak months there are Ice Cream Vans for refreshments at the car park. On a low tide look out for tusker rock about a mile out from the beach, also on these low tides the various different bays along this coast merge, so you can walk through Hardy's bay and even onto Southerndown without leaving the beach. There can be good waves for surfing at Ogmore and Southerndown. 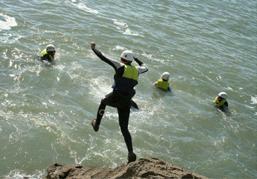 There are professional Coasteering activities at both Southerndown and Ogmore. Andy from http://walesoutdoors.co.uk offers a large range of activities including cliff jumping, surfing lessons, kites and boards activities, cliff climbing and muti activity days out. Southerndown Surf School also operates at Ogmore Beach, so if you just want to learn to surf, surf lessons in Southerndown and Ogmore can also be arranged by Daryl Davies. Southerndown Surf School offers surf lessons to all ages between 8 and 8o. You will be learning to surf with a BSA (British Surfing Association) qualified coach. On low tide you can get to this beach by crossing the river from Ogmore Beach. (Please be careful as there are strong currents here) Once on Newton Beach you can walk to Porthcawl fairly easily. Don't forget to check on the tide tables to make sure you can get back. Tide Table can be found here. Southerndown is the next village along the coast from Ogmore by Sea. Southerndown is a very small village with a large cliffed beach. There is one pub "The Three Golden Cups" and a Restaurant "Frolics". There is a shop in the beach car park that is open in summers season. Southerndown Beach is the second largest sandy beach on the coast of South Wales outside of Barry. It also has the second largest tidal range in the world. (In fact in 2008 it had the largest tide in the World). A good surfing beach it now has it's own Surf School, aptly name Southerndown Surf School run by Daryl Davies who is a BSA (British Surfing Association) fully qualified surf coach. For surf lessons in Southerndown contact Southerndown Surf School call 07837 774591. 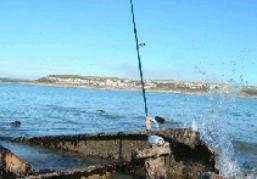 Southerndown beach is also good for bathing, sunbathing and fishing. Dunraven Castle, which once stood on the headland overlooking Dunraven Bay. More a fortified mansion than a castle, it had its own kitchen gardens and landing stage in the bay. It was lived in right up until the 1940Õs but was demolished in 1963 as it was crumbling and considered unsafe. Although the Castle is no longer there, the gardens can still be seen. There are many legends of smuggling and deliberate shipwrecking associated with this dramatic spot. Dunraven is now home to the Heritage Coast Centre where information of the 14 mile of unspoiled cliffs and coastline is available. The Vaughan Family once lived in Dunraven Castle. The head of the family, Walter Vaughan wasted his entire fortune on fast living and a life of extravagance. Three of his children drowned in an accident in the nearby sea, so Walter made plans to set up a sea rescue business. Sadly, he was refused permission by the governing body of the time. Walter was so annoyed at this he co-operated with a well-known notorious pirate called Mat of the Iron Hand (due to his hooked hand), and helped to organise shipwrecks, which he then plundered for treasure. One of the techniques used was to tie lamps on the tails of his sheep at night. As the sheep wandered along the cliff top, they inadvertently lured the ships to their doom. His ill-gotten lifestyle came back to haunt him when his sole surviving son became one of the victims of his shipwrecks as he was on his way home from his travels. Who knows if the story is true other than Walter himself, but it is considered fact in the area. The story of Walter is just one of many tales associated with Dunraven Castle. Apparently, when the castle was used as a convalescent hospital during the first World War, the ghost of a young woman, known locally as the Blue Lady, was seen many times by the staff. They claimed they could tell when she had appeared, as she left a prominent perfume smell behind her, which resembled the yellow mimosa flower. The constant roar of the surf on the cliffs at Southerndown could well have been the origin of the next story of the area, or it might even have been Walter Vaughan himself, who originated it, to frighten away curious locals during his ship wrecking days. The story related says that a prophet of death and doom known as the Cyhiraeth was the reason for the noise. It would let out terrifying moans that people could hear from a distance. The story eventually came to be a foreteller of a sea disaster. There are several options for fishing around the tipis, the river a stones throw away for trout, sewen and grey mullet (club permit & rod licence req'd). Alternatively a short walk to the tidal water of the river and it's mouth where you can freely fish for mullet, bass and other sea fish.